David and Louise Turpin, the California couple who held their 13 children captive in a squalid “house of horrors,” have pleaded guilty to 14 felony counts against them. 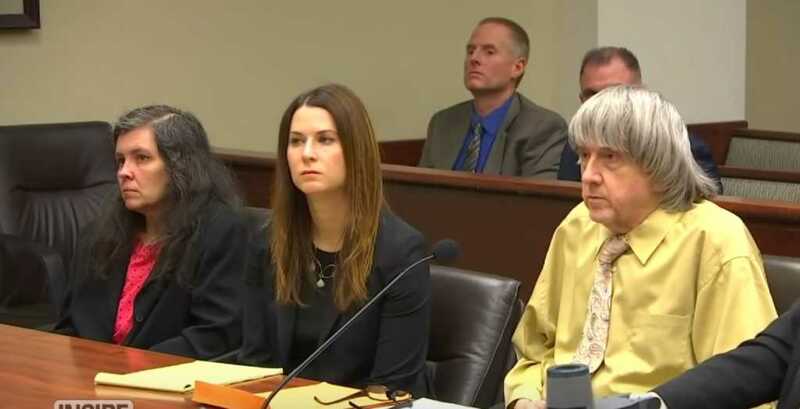 The Turpin’s, who were arrested back in January 2018, admitted to multiple counts of false imprisonment, child endangerment and adult abuse. They both face a sentence of 25 years to life for their heinous crimes. “Of course, in my heart.. I’m not stupid.. and I knew all the evidence against her,” she added. What sort of treatment did the children face? At the time of rescue, police stated that the family home was covered in excrement and filth, and some of the kids were chained and padlocked to pieces of furniture – they were allowed one meal a day and just two showers a year. The children pleaded with responding officers to give them food as they were all extremely malnourished. The children, ages 2-29, were found “shackled to their beds with chains and padlocks in dark and foul-smelling surroundings,” according to a police statement. “It’s what happens when people are chained up – there’s nowhere else to go to the restroom,” he said. While the identities of the children remain hidden for their welfare, by all accounts the kids are said to be doing very well. There was initial speculation that they might have to testify in court, but this has since been negated by the fact that their parents took the plea deal. There will be no trial. Instead, a simple sentencing hearing has been scheduled for April 19 as the final act in this horrifying case. “They are not going to have to be put on a witness stand and dissected by some defense attorney. Why put they through more torture?” said Corona Regional Medical Center CEO Mark Uffer, who played music with the adult children shortly after their release. Jack Osborn, a lawyer who represents the children, said his clients did not want to relive the “trauma” in court and were “relieved” they would not have to forgo their anonymity by speaking in a public courtroom. Osborn noted that all the children were healthy and that they were finishing up their education and enjoying a normal, everyday life. “They view themselves as survivors,” Osborn added. At the time they were rescued, the eldest victim, a 29-year-old female, weighed just 82 pounds. The children all required immediate hospital treatment, with some extremely malnourished, and others saying they had not showered in over a year. “This is among the worst, most aggravated child abuse cases that I have ever seen,” D.A. Hestrin said. Do pray for these children as they move forward with their lives — that they might be healed of the ghastly trauma and be blessed as they grow up.